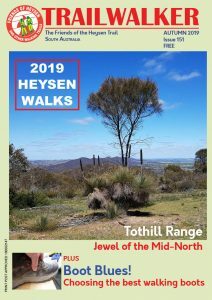 The first vision for the Heysen Trail was a trail that followed the spine of the Flinders Ranges, from the mid-north town of Crystal Brook in the south to Mt Babbage in the north. 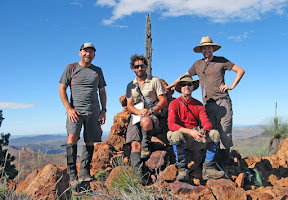 The trail was constructed from southern Cape Jervis, following the Flinders Ranges spine north from Crystal Brook, to Parachilna Gorge in the central Flinders Ranges. Extending the Heysen Trail to Mt Babbage is no longer on the agenda but it is a good destination for wilderness walkers. This page collates some of the experiences of those walkers, in order to share this with other walkers seeking to follow the way north. We encourage anyone who tackles walking north of Parachilna to contact us and share their experiences, track notes, route information or maps so we can publish them on this page. If you find incorrect information on this page, or can contribute more torwards it, for instance a correction to a pastoral station entry, or addition of a tour operator, please contact us. The northern trailhead of the Heysen Trail is at Parachilna Gorge. There is no trail north of Parachilna Gorge. Walkers will need a high degree of navigation skills, using a compass, topographic maps of various scales, and possibly a GPS unit. There are few public roads and few 4WD/old station/old mining tracks, some of which are in very poor condition (and unsuitable for vehicles) and may be overgrown and difficult to follow. Walkers should expect to go for periods of a week or more without seeing anyone else. Sourcing water may be the most difficult logistic to overcome. Water availability from creeks, waterholes, springs, dams and tanks (some old and unserviced) varies from season to season, and year to year. Water drops are often needed. Except for Vulkathunha-Gammon Ranges National Park the land is private, you will need permission from landholders. Some land is pastoral lease, some is aboriginal communities, some is national park or wilderness sanctuary. Information about current water conditions from these parties could be invaluable. Please respect landholders and future walkers by gaining permission for all property you cross. There are very few facilities. There is no mobile phone service whatsoever. The way between Parachilna Gorge and Mt Babbage is cut by a single public road, a dirt road from Copley to Arkaroola. 40km north of Mt Babbage lies the Strzelecki Track. The only shops of any sort are at Iga Warta and at Arkaroola Wilderness Sanctuary. This area is remote, a PLB (Personal Locator Beacon) or similar emergency device should be carried. Rain falls in the Gammons and northern Flinders Ranges (Arkaroola and north) area over summer, not winter. The rain season correlates with the wet season in the continent’s tropical north, rainfall comes from dissapating tropical storms and cyclones. Winter rains from the continent’s southern weather systems fall in the central Flinders Ranges, often not affecting areas in the northern Flinders Ranges. Check recent rainfall on the Bureau of Meteorology’s website – there are rainfall gauges at Hawker in the south, and in the north Leigh Creek, Arcoona Saddle (Vulkathunha-Gammon Ranges National Park), North Moolooloo and Arkaroola. Here are some links to tracks notes, maps, route information, articles and photos of walkers who have undertaken these walks. Walked three week long walks, carrying lightweight packs, with no vehicle support. Followed creeks, valleys, ridgelines and tracks. La Nina – the warming of the oceans which cause increased rain over much of Australia – was in effect for the last two walks. The second walk was undertaken when La Nina had recently begun, creeks were flowing in the Gammons, the best season in 20 years. The third walk was undertaken when the La Nina effect had intensified into one of the strongest on record, the best season in 40 years. Broad area map – www.hema.com.au, 1:400 000 scale of the Flinders Ranges from Mt Hopeless to Melrose. The SA Government produces a series of 1:50 000 scale maps (1km = 2cm) of much of the state. Although maps are allocated for the entire state, not all of the maps have been produced. This map series extends to just north of Arkaroola. The maps are available from the Department for Environment and Water (DEW) Map Finder (download as JPGs or delivery in A1 prints) or from these stores and resellers. The Australian Government produces a series of 1:250 000 scale maps (1km = 4mm) of the entire country. These maps are available for free download. Some maps from the 1:250 000 series are no longer being printed, these maps may be difficult to source from retailers. Some map retailers can print a selected 1:250 000 data area as a paper map. The maps are available from these map retailers or direct from GeoScience. The coordinates of many geographical landmarks, including mountains, waterholes and huts, can be found by searching either the South Australian Government’s South Australian State Gazetteer – PlaceNames Online or the Australian Government’s Geoscience Australia – Gazetteer of Australia. Much of the land is private, mostly pastoral lease stations, some is aboriginal communities, or wilderness sanctuary. The only public land is the Vulkathunha-Gammon Ranges National Park. Pinda Springs (not shown on map, it is the north-western part of Mulga View), ph ???? ???? Public Access Routes (PARs) were established to provide public access over pastoral land without the need for travellers to ask permission from the lessee of the pastoral lease. There are 24 PARs in South Australia, of which three might be of interest to hikers in this area. Details of PARs are available from the Department of Environment and Natural Resources and by viewing this map of the Flinders Ranges – PARs are shown on the above map with the following icon. Roads north of Port Augusta and Quorn can be affected by rainfall. Dirt roads may close for a week or so after heavy rainfall. Dynamic signs are placed at the entry point to roads providing live information. Road report information from Transport SA can be obtained by phoning or 1300 361 033 or visiting www.transport.sa.gov.au. There are servicable airstrips at Hawker, Rawnsley Park, Wilpena Pound, Blinman, Nepabunna, Balcanoona, Arkaroola and Moolawatana. The airstrips at Mt Hopeless Outstation and Mt Fitton are not servicable and no longer appear on aviation maps. Other stations providing tourism services may be able to provide transport services upon request. Create your own climbs log for any peak, summit or mountain in the world. Climbed it, bagged it? Find the peak on the map, or add it yourself, and mark it off.